LASER COMPONENTS is a powerful trade name: internationally renowned, LC stands for quality and individual service that extends from OEM development to the series production of products available long term. Our first priority is our customer: we have competent service partners who are available when you need them to field your inquiries. On this page, we will provide information on our EU trademarks. We have stayed true to our logo since the founding of our company in 1982. The figurative mark was officially registered as a trademark in 1993. We have been informing our customers about new developments in the photonics world since November of 1991. What started out as an informational pamphlet called “News” was developed into a full-fledged newsletter and christened Photonics News® in October of 1996. Almost 20 years later, we made the next big leap by developing an informative magazine that has been issued up to three times a year since September of 2015. The “Photonics News®” trademark was officially registered in 2009. FLEXPOINT® is the brand name of the laser modules developed by LASER COMPONENTS. What started out as a figurative mark in 1993 became the FLEXPOINT® trademark in 2007. We have been manufacturing laser modules since 1987; in 2010, we began production at two different facilities – one near Lake Constance and one at the headquarters in Olching. 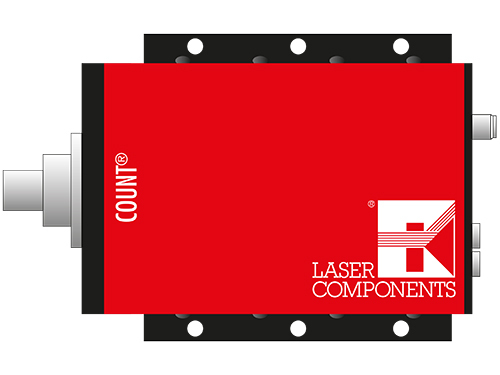 In order to count single photons, do not miss out on our COUNT® modules. These single photon counters are a successful example of our corporate development and we have been the proud owner of the COUNT® trademark since 2012. We have requested proposals from all of our branch offices in the search for a name for our fiber couplers. This is yet another example of our corporate development. The name FiberKey® prevailed, and the trademark was registered in 2016. We do not often register a trademark for individual components; however, these pulsed laser diodes are extraordinary: QuickSwitch® PLDs have a pulse of a few ns and are, therefore, extremely fast. They have earned their trademark name, which was developed for market introduction in 2018.